America’s Cup racing pays dividends. That’s the message from the New Zealand Marine Industry following the announcement of the 36th America’s Cup protocol this morning. 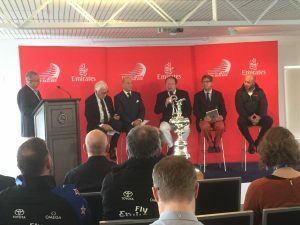 The NZ marine industry will be working closely with the Auckland Council, and government to do whatever is required to ensure the challenge and defence for the 36th America’s Cup is held in Auckland in 2021. “When New Zealand won the Cup in 1995, the marine industry was instrumental in convincing the Ports of Auckland, then owners of the Viaduct Harbour, to make provision for superyachts in addition to the syndicate bases. This gave Auckland a new ‘front door’, with the building of the Viaduct Harbour, and its superyacht and charter boat berthage, open public spaces and restaurants,” says Peter Busfield, executive director NZ Marine. “The 36th Cup has the potential to attract an estimated 150 superyachts to our shores, and with each contributing an average of $3m to New Zealand’s economy, this is effectively an export market that floats to our shores,” continues Busfield. Booking enquiries are already being fielded for superyacht berths from 2019. Significant business opportunities are expected nationwide, with Northland, Auckland, the Bay of Plenty and the Marlborough Sounds particularly likely to see maintenance and refit work provided for visiting yachts. “More than $700m was injected into New Zealand following the last Cup held here, 14 years ago,” Peter Montgomery advised an industry meeting, following the protocol announcement. Yacht guests almost always visit the vineyards, golf courses and places of outstanding natural beauty which New Zealand’s regions are known for, and while a large superyacht might spend up to $200,000 on flowers over several months for example, it’s also likely to be accompanied by a private jet, as VIP guests, family and friends join the vessel. America’s Cup races are known to attract entrepreneurs, investors, leaders and influencers to be part of the action. New Zealand’s Millennium Cup superyacht regatta attracted one of the largest ever racing superyacht fleets in the year 2000, and the NZMarine Export Group plans to continue to run annual Millennium Cup Regattas, with the 2021 edition expected to attract another bumper fleet. “Emirates Team New Zealand has handed us an opportunity, but they need us all behind them. Industry, country and government,” summarised NZ Marine president Myles Fothergill.